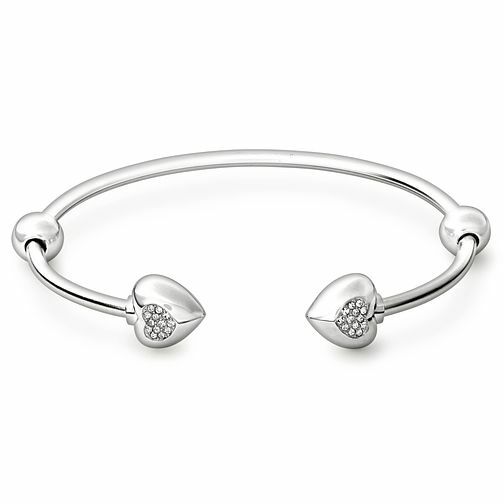 A chic sterling silver medium cuff bangle, styled with two hearts pave set with clear crystals for a look that sparkles. Discover all the ways to express yourself with one of a kind jewellery that reflects your life and experience. Inspired by your personal sense of style, Chamilia jewellery is as unique as you are. Chamilia Pave Heart Swarovski Crystal Bangle Medium 7.9" is rated 4.7 out of 5 by 3. Rated 4 out of 5 by Anonymous from Beautiful This bracelet is stunning very happy with purchase so much so that I went and bought another one.